Red bell peppers, onion, garlic and parsley pack our savory chicken-flavored sauce with even more great flavors. Our Chicken Pasta Sides makes dishes like Buffalo Mac stand out at dinnertime. Chicken Pasta is rated 4.5 out of 5 by 129. Rated 5 out of 5 by Oltl4evs from As comforting as chicken soup! These were known as "chicken noodles" when I was a kid. My Mom made chili and we had no pasta, but she had a package of these noodles to go along it. Sounds weird, but totally worked. Done, instant family favorite!! 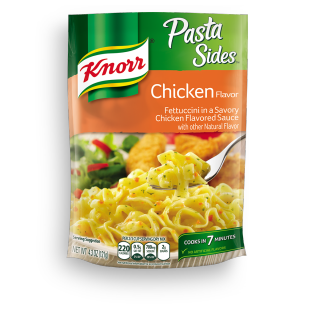 Delicious chicken flavor, one of the best in the pasta line. Rated 5 out of 5 by Kitty60 from This was a great Boneless Chicken Recipe This actually came out really delicious I wasn't sure if we would all like it but, we did. It was a quick and easy dish to make in no time at all ! !